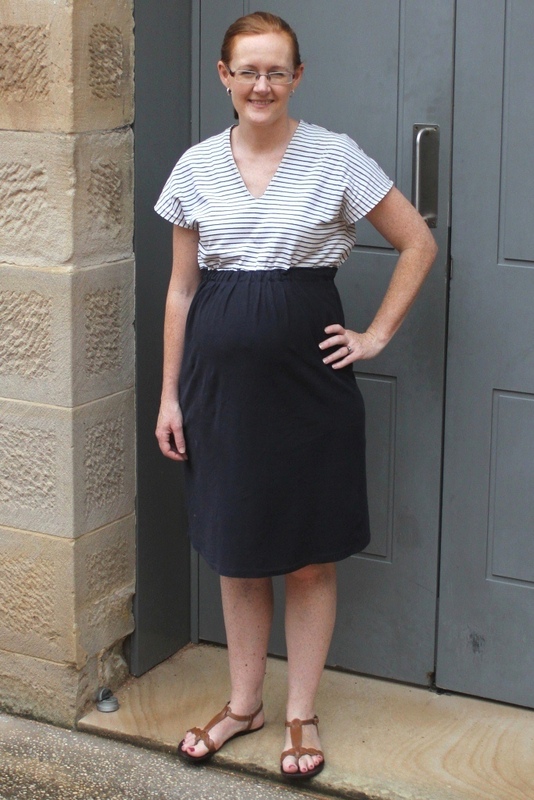 I used a white and navy blue stripe knit from the stash for the bodice and some navy jersey bought from Spotlight for the skirt. I sewed this mostly on my overlocker, and just used a twin stitch for finishing the hem and other edges. I've gotten a lot of wear out of this one so far as it is really comfy whilst still having good coverage. The pattern is quite deceptive because I didn't extend the sleeves at all, yet they did turn out a lot longer than I thought they would from the pattern line drawing. But a bit of shoulder and upper flabby arm coverage is good for me at the moment! Although this was an extremely easy pattern to make, I did have trouble with the neck facings. I don't know if I traced these wrong or what I did incorrectly, but for some reason the back neck facing was way too wide but the front neck facing was too short so that it wouldn't sit flat. So in my usual meticulous and highly professional sewing manner *cough cough* I fixed it by cutting a slit in the front facing at the button of the 'v', folding a pleat in the back facing and holding the facing down all the way around with iron on double sided interfacing! In the comments to the last post Jean asked if I would be induced this time around too. I'm hoping with all my fingers crossed that this labour starts and progresses naturally (not too long after the due date either!) because I've heard that induced labours are more painful and I could do with a little less pain. Plus we missed out on the excitement of the dramatic movie style waters breaking, and the mad dash to the hospital so if it happens naturally it'll be like a first time experience (well that bit anyway, the rest I remember with vivid clarity). I've just found out that my sister in law is going to be having her second son a few months after I'm due, which is exciting for them and good for Anna because now she'll have two male cousins to torment! But as for me I still have absolutely no idea what I'm having - this one is moving around a lot more than I recall Anna doing, plus I am more tired, a different shape and had much worse morning sickness but I'm also running around after 3 year old plus working part time, am nearly 35 now and having been trying to maintain a better diet this time around so I don't think anything there's anything meaningful in those differences. I'll have to wait and see, just like nature intended! I've clocked up 30 weeks of pregnancy this week, so in theory 10 weeks to go. Since Anna was 2 weeks late (and even then required quite a lot of inducement to come out) I'm not holding my breath that this one will be on time. Ironically this time I feel much heavier and have quite a lot of aches and pains but I haven't put on as much weight as last time. 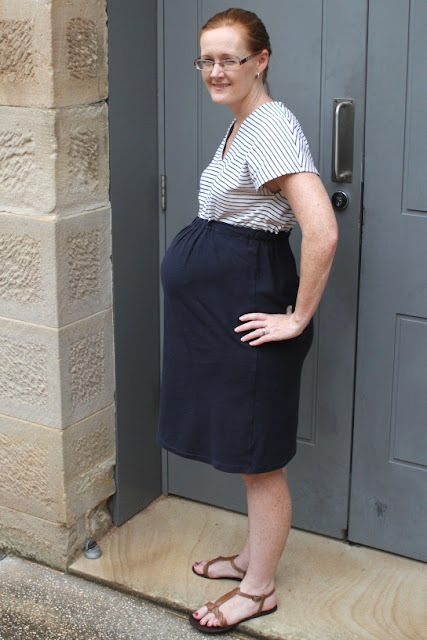 In fact I have a few maternity clothes I made last time that are still too big for me to wear - I wore a skirt to work during the week that I got sick of pulling it up so I accessorised with some bulldog clips to cinch it in! But still I have grown out of a few clothes due to my expanding rear and hips, mostly my casual clothes which is what I need most now given that I only work part time this time around and spend quite a bit of time at the park, the library, the museum or other kid orientated places. 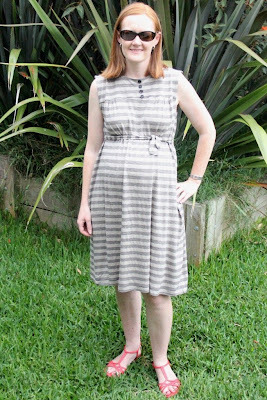 So even with only 10 weeks to go I'm still sewing maternity clothes - I have the fabric and the will, so why not? 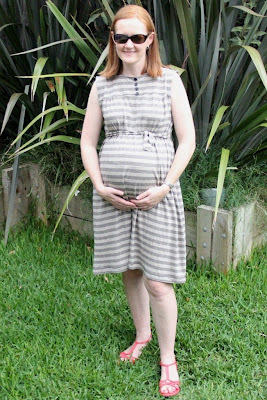 This latest dress is the ultimate in comfort but is not one of the best looking dresses I've made, but for once appearance isn't exactly at the forefront of my mind as I try to waddle around in our summer (which has been quite mild to date thankfully!). So I have actually been wearing this quite a bit, although I feel a bit sloppy and blah. The only review for this pattern on Pattern Review notes the same issue, so I guess it's not just me. I used Burda 4/2010 #122 which need very little modification to make it maternity friendly. In fact after wearing this a few times I'd say it needed no alteration at all, but to be safe I added a bit extra width to the front dress panel but it's so roomy that I don't think I needed to do that at all. I also stuffed up by sewing the front bodice and lining together at the neckline and the shoulders, plus the same with the back bodice so I couldn't join the front and back together at the shoulder! D'oh..... 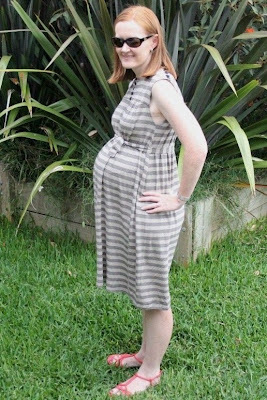 But I was too lazy to unpick since I sewed this dress mostly using my overlocker, so my dodgy solution was to just lay the front piece over the back, topstitch along the shoulder and then sew on four buttons to cover it up. Yes, I was even too lazy to make buttonholes! The other changes I made was to leave off the front opening placket and instead I just sewed on a few buttons on the front where it should be have been - I just couldn't be bothered making the placket since I knew I wouldn't wear this unbuttoned. 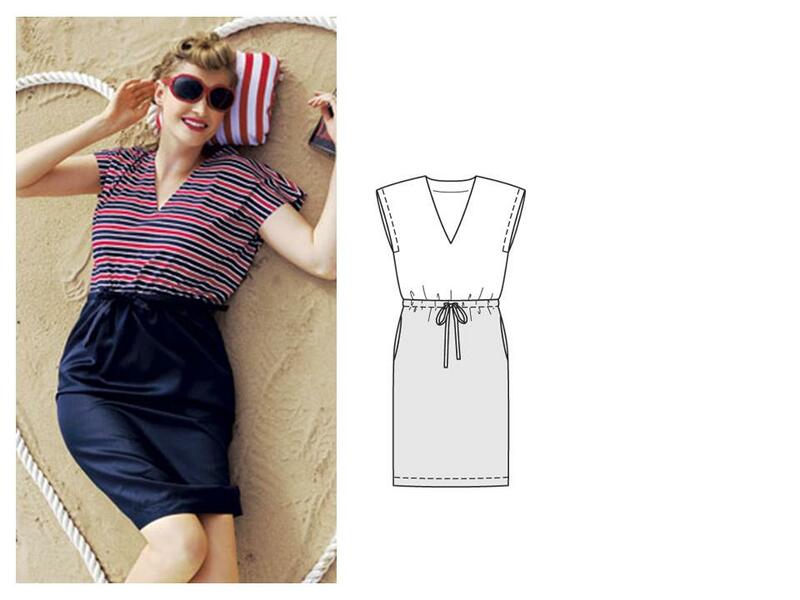 The pattern also required a double layer of the fabric (recommended jersey) but I thought that was unnecessary and too hot for summer so I only made a single layer for the dress body and just a self lined bodice. And I left off the rectangle square at the front that makes a channel for the tie, instead just leaving the tie loose so I could tie it above the baby bump wherever I wanted. The fabric I bought from the Remnant Warehouse a few months back when I bought the swimsuit fabric. I don't recall the fabric content label, but I just thought it was a cotton jersey in grey marle with fine black stripes. After washing it and smelling that unmistakable wet dog smell I realise it's actually wool jersey which made the price I paid ($9.95/m at 145cm wide) an even bigger bargain. 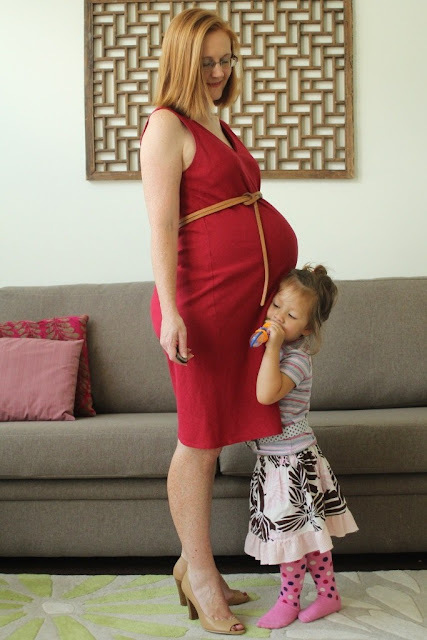 I might remake this blah dress into a simple skirt post pregnancy to get some better use out of the fabric. Speaking of the swimsuit fabric, yes Kyle it really does say Nookie Beach which is a bit funny given the connotations but it's actually a fashion label here in Australia and I guess this is remnant from their summer line a while back. 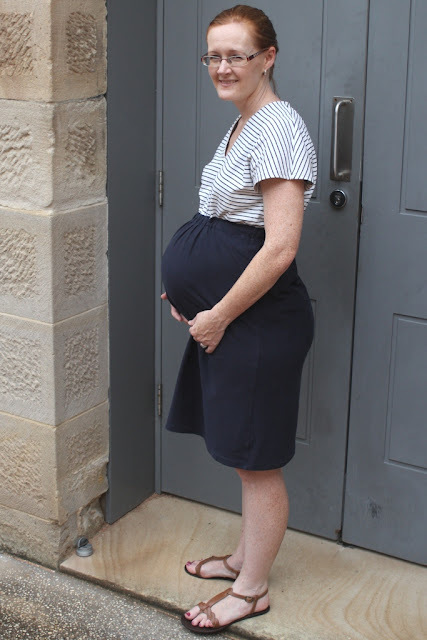 And thanks everyone for your flattering comments - we really are our worse critics but I am finding also that the older I get and the more lumpy and bumpy I get post child(ren) I am also getting less self obsessed about how I look. Yes I am aware of my faults, and I try to minimise them through what I wear, but I've also realised that this is as a good as it gets - I'm sure when I'm 60, 70 or 80 I'll wish I look like I do now! It's probably way too late for Christmas related puns, but I did manage to finish sewing my maternity swimsuit on Christmas night just before we left the next morning for our holiday. And I'm so glad I did - I like how they turned out so much that I only wore the ones I made and not the tankini I had purchased 'just in case'. And they didn't fall apart either - they withstood swimming at the water theme park, the beach and the hotel resort pool with nary a popped stitch (phew!). 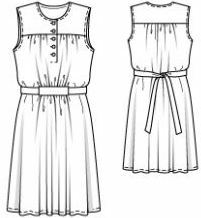 To recap I used Kwik Sew 3416, view A although I made two shoulder straps instead of a halter strap. but it is a huge mess on the inside though! The straps get sewn on last so the raw ends of the straps are visible, and the overlocked edge with the elastic stitched on by zig zag looks quite messy. Not only does this look a little bizarre and most unlike RTW, but the raw edge and the zig zag stitching is a little *ahem* itchy against that sensitive area of skin (sorry if that is too much info!). If I were to make this again I would make put another layer of lining fabric in that covered up the bra cups to avoid this. I would also possibly insert an underwire into the bodice as well to give a bit more shape and definition - you can see from that side on shot above that I am not overly endowed in the chestal region, but what I do have has sagged after pregnancy and 13 months of breastfeeding so I could use a little 'lift and seperate' action happening!! So for about $20 I have made myself a pretty decent pair of maternity swimmers. Whilst I do think swimsuits are extremely expensive (the last non maternity suite I purchased was $165), I do take my hat off to the sewists - these are extremely fiddly and rather time consuming to sew comparative to the size of the garment! While we were away Anna turned 3 and in the tradition I started for her I made her another birthday dress (2nd birthday dress here and 1st birthday dress here). It was tough work to get her to put it on because her favourite dress at the moment is a Dora the Explorer dress given to her as a hand me down that she wears practically every day unless she's been naughty and I make her take it off to wear some shorts and a tshirt as punishment! 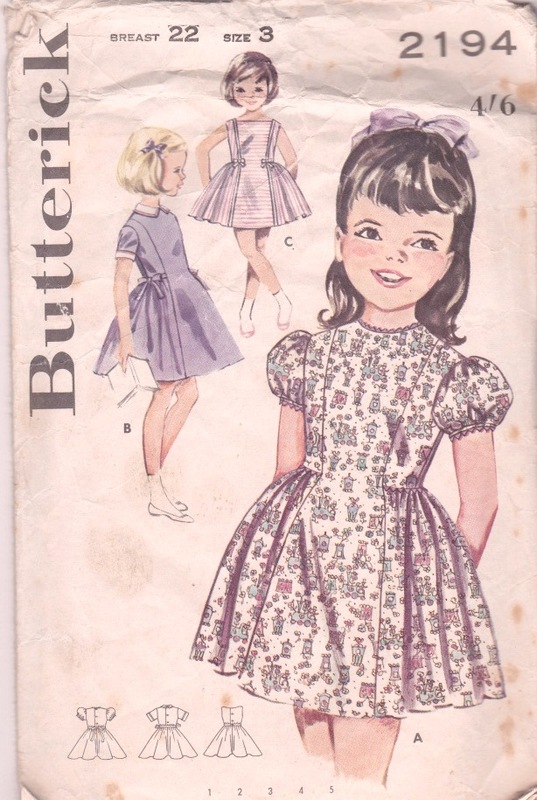 I made a vintage pattern, Butterick 2194, which is undated but I think is circa 1950s possibly early 60s. Check out that pouty face - she has certainly turned into a little drama queen!